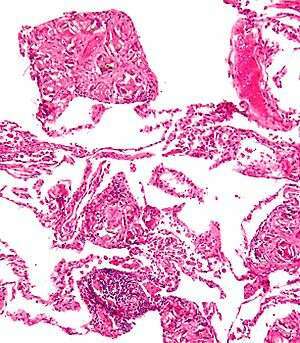 Pulmonary talcosis, less specifically referred to as talcosis, is a pulmonary disorder caused by talc. It has been related to silicosis resulting from inhalation of talc and silicates. It is also tied to heroin use where talc might be used as an adulterant to increase weight and street value. It is one of several noted associations and possible risks of street heroin use. Talcosis can also arise from the injection of drugs intended for oral administration, as talc is present in many tablets and capsules that are used intravenously, such as benzodiazepines, dextroamphetamine, and prescription opioids. ↑ Obstetric anesthesia: principles and practice. David H. Chestnut. "For example, the injection of talc-diluted heroin causes talcosis." ↑ Davis, LL. (Dec 1983). "Pulmonary 'mainline' granulomatosis: talcosis secondary to intravenous heroin abuse with characteristic x-ray findings of asbestosis.". J Natl Med Assoc. 75 (12): 1225–8. PMC 2561715 . PMID 6655726.